According to Directive 2002/44/EC on body vibrations, employers must prevent their employees from being exposed to vibrations greater than 1.15m/s2. The same directive also states that employers must take preventative measures if vibrations over an eight-hour workday exceed the action value of 0.5m/s2. 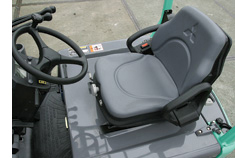 In an attempt to meet these conditions, forklift manufacturers are using different techniques to ease vibrations. They have started including suspension (floating) cabs, suspended powertrains (in diesel trucks). They also adhere to a minimum clearance for mast and chassis. More attention is also being paid to the quality of the driver’s seat and the type of tyres fitted.